Chromalux bulbs don't distort colors — they enhance colors by absorbing yellow and dulling other components. As a result, the light is purified. The blue, green, red, and violet components are strengthened, without producing an imbalance of one color over another. The complete unit ships with a heavy-duty 10" diameter aluminum reflector that swivels to all angles. The aluminum reflector is intended for use with bulbs that have a maximum wattage of 75W. Higher wattage bulbs should only be used without the reflector. 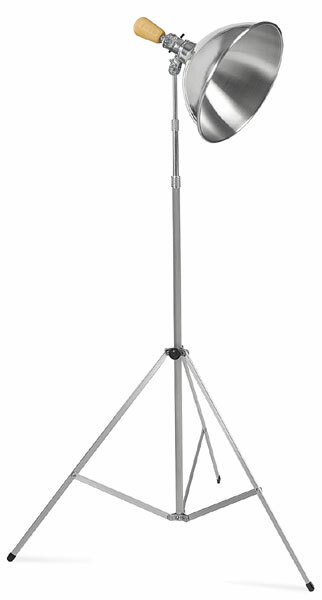 The sturdy aluminum, three-section stand extends up to 7 feet tall and folds down and telescope for storage. It has a metal socket with a wooden knob that stays cool to the touch. Its power cord is 8 feet long and plugs into a standard wall outlet. Chromalux Halogen Flood Bulbs — These bulbs have a color temperature of 4200°K and are rated to last approximately 3,500 hours. Chromalux Regular Bulbs — These frosted blue bulbs have a color temperature of 3200°K and are rated to last approximately 5,000 hours.